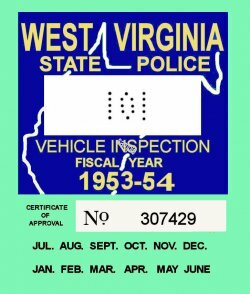 1953-54 West Virginia inspection sticker - $20.00 : Bob Hoyts Classic Inspection Stickers, Add a Final Touch to your Restoration! This 1953-54 WV inspection sticker was created from an old nearly illegible original. It is unknown when WV began it's official statewide Inspection program. Early on there were various forms of inspections performed on vehicles stopped for faulty equipment. The owner would be required to have the vehicle repaired and inspected. Our patented stickers have a "Peel and Stick" feature that allows you to attach the sticker inside your windshield. For an additional $10.00 buyer can add your personal antique license plate number on the front of the sticker.